Our Epsom, Surrey customer had never considered shutters as an option for her conservatory roof when she started out renovating the kitchen which the conservatory is built on to. She had often bared the brunt of direct sunlight in the kitchen at various times of the day and when reviewing options she came across our wooden shutters in a magazine article. She was delighted to hear that triangular wooden shutters were something we were able to deal with and that a conservatory roof should not be a problem for us here at Shutterly Fabulous. We were able to measure up and offer her a quote and talk her through various design options for her conservatory roof wooden plantation shutters. 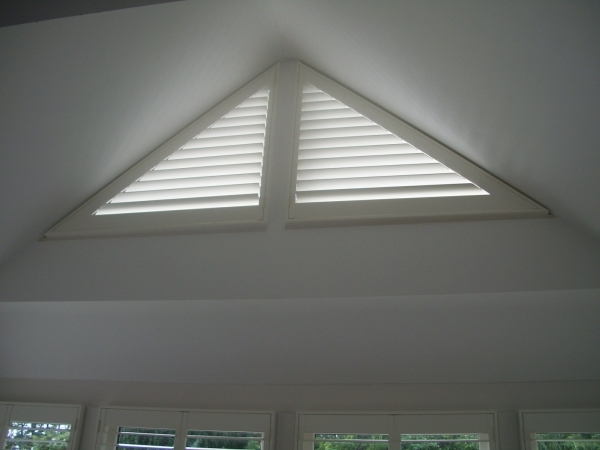 These conservatory roof wooden shutters are a fantastic example of how versatile our shutters can be and how skilled our team is, here at Shutterly Fabulous in Brighton and Hove, East Sussex. Shutterly Fabulous offer expert, no obligation shutter design advice and if you have a conservatory, you might be interested to read our June 2015 blog article about featuring a tricky conservatory shutter installation.